In 1830 the Moravians in North Carolina initially declined to allow the appearance of a menagerie in their midst, but when "the circus men, out of respect for our town," moved it to a nearby site, local residents attended in large numbers. In the future, the circus owners assured Moravian leaders, they would not "present improper theatrical scenes," and in 1834, with "a procession of wagons," they presented an acceptable performance. It may have been while he was on this circuit that a young circus man, P. T. Barnum, made an important move. His autobiography recounts that on 12 Nov. 1836 the troupe camped in a grove by the river at Rocky Mount. Here Barnum used his savings to purchase the financially strapped circus and set off on a successful career under his own management. Elsewhere in North Carolina, it was estimated that on 9 May 1856 there were 1,100 spectators to see a menagerie, circus, and other attractions at Bethabara. It was around the same time that Alonzo T. Mial of Wake County bought tickets and took all of his slaves to the circus. While no national-level circuses have originated in North Carolina, the state has seen a continuous stream of both small and large groups visit many cities from the coast to the mountains. The Ringling Brothers and Barnum & Bailey Circus, a regular visitor to Raleigh, Charlotte, and other North Carolina cities, offers a special educational show catering to school groups. A growing movement in support of circuses that do not feature animal acts-based on the belief that such acts are dangerous and degrading to the animals involved-gained momentum in the 1990s and early 2000s. P. T. Barnum, Struggles and Triumphs, or, Forty Years' Recollections of P. T. Barnum (repr., 1981). George Speaight, A History of the Circus (1980). 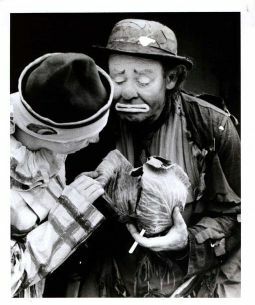 Photo of Emmett Kelly, Circus Clown, in Raleigh, NC. Image courtesy of NC Museum of History, call #: H.1957.63.20. Available from http://collections.ncdcr.gov/RediscoveryProficioPublicSearch/ShowItem.aspx?35816+ (accessed July 9, 2012). 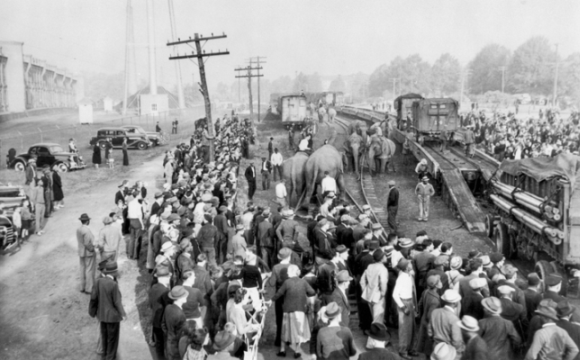 Arrival of the Barnum & Bailey Circus train at Durham, 1940. North Carolina Collection, University of North Carolina at Chapel Hill Library. Courtesy of J. Marvin Black.